The last month I’ve been trying to get some good images of birds, but even with Nikon 400mm with teleconverters the distances are often too big. Many birds are shy and will be frightened and disturbed if a photographer tries to get close to them. Nevertheless a possible way to approach shy animals is to use a car. I experienced that when my father and I went to Skallingen in Jutland to look for waders at the Wadden Sea. We were at the location at 6.00pm and drove slowly along the road when a northern lapwing suddenly appeared at the right site of the car in a beautiful yellow morning backlight in the in the grass wet of big dews. 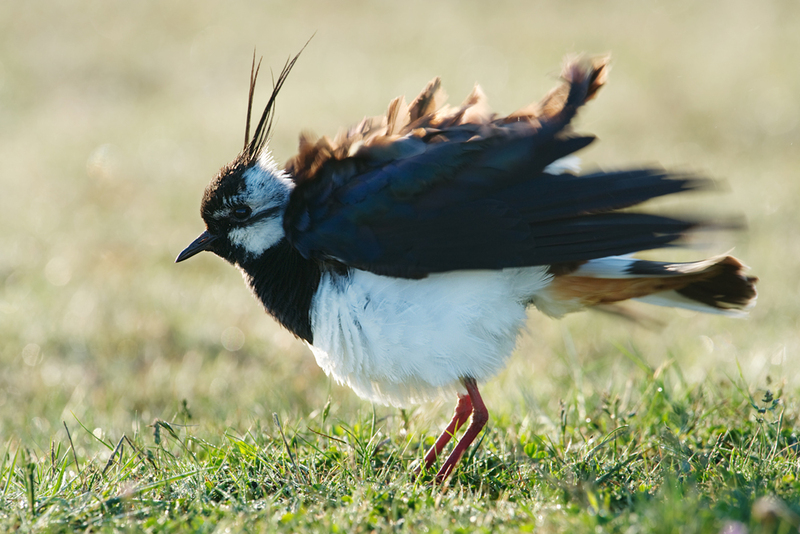 I pulled the trigger and got approximately 100 photos, while the lapwing cleaned its feathers and shaked itself, before the bird turned around and looked away from me. I was lucky to choose a shutter that shows the movements in the feathers of the bird, but leaves the head with acceptable sharpness. 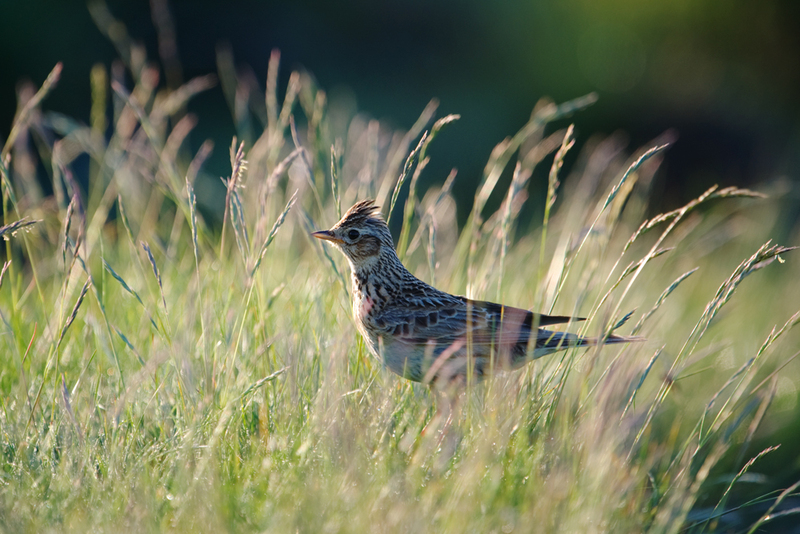 Well, we continued our trip but soon we stopped for a eurasian skylark hiding in the grass. The distance was acceptable to get usable photos and I hence got some shot off which I prefer the image shown below. As well as the previous photo I was forced to shoot in a backlight, but I will not consider it as a problem since the photo have got a "clair obscure"-like light. When we finally arrived at the beach we didn’t really saw anything. Some waders walked around at the costline and approximately 300m from us lots of common scoters laid on the sea. Finally we decided to drive to a new location without any spectacular observations. 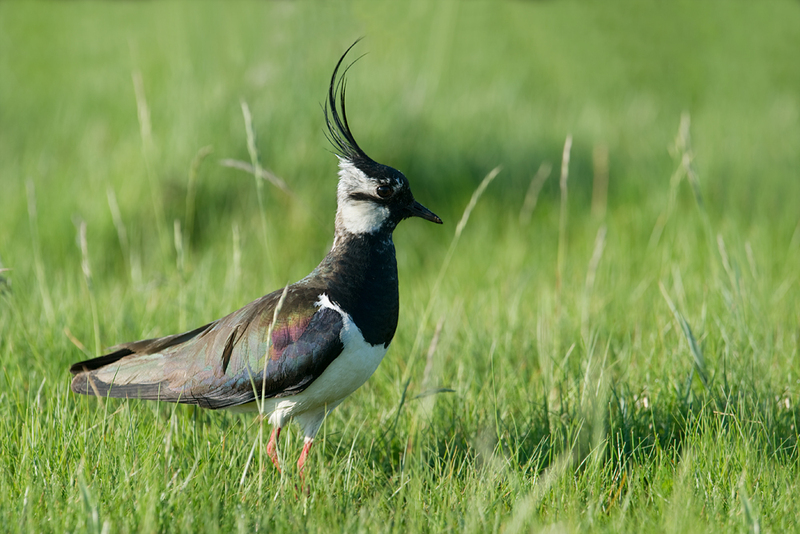 On the way back the lapwing had walked across the road and stood majestic in the long grass. Off course I took advantages of this favorable possibility to get some shots. In Photoshop the photo is recovered from highlights in the feathers. On this short trip I learned two important things. First of all a car is a good (maybe a bit unsatisfactory) way to approach birds and other animals suitable for nature photography. The second thing concerns the use of the Nikon 400mm. In my opinion the sharpness of the 400mm with the 1.4x is not good enough when used wide open. I used both f/4.0 and f/7.1 and found that the smaller aperture gave much better result. In the future I will try to investigate the sharpness of the 400mm with and without converter.